Well, it is officially that time of the year again. The birds are singing and all the colors look brighter. 😉 Yep, it’s back to school time! Unfortunately, the chaos that can ensue each morning can ruin an otherwise beginning to a wonderful day. So, to help keep the chaos down to a minimum, I am sharing some of my favorite back to school organizing tips. 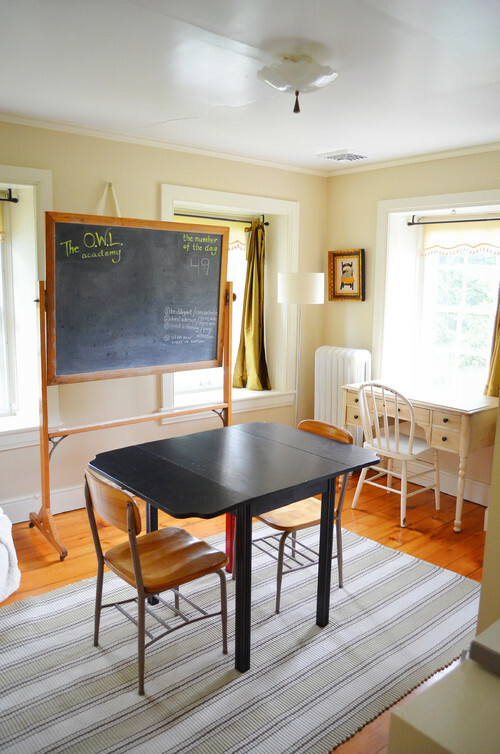 Having a dedicated place to send the kiddos for homework can really help to keep your home from becoming a madhouse. If your a homeschool mom, such as I, then versatility may be a big deal to you. Using a table with drop down leaf(s)* can help to make things multipurpose. (I also love the idea of a roll-away board like this one. It is double duty because you can flip it over to expose a map or a cork board). 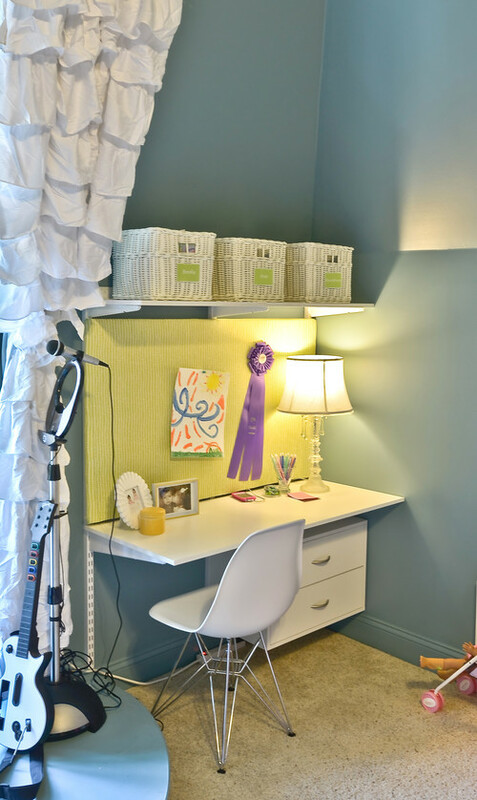 If you want to install a desk unit on the cheap and easy, consider using the closet track systems that are available in most of the big box hardware stores. A few shelves and a small set of drawers and you have an instant work space that is completely adjustable. This is especially useful for small children who need a lower set desk and shelving. As they grow, just raise the shelves to a higher level to compensate for their change in height. Another great idea for keeping things organized on the cheap is to screw a few bungee chords to a wall. These are great for holding books or stuff animals up out of the way. 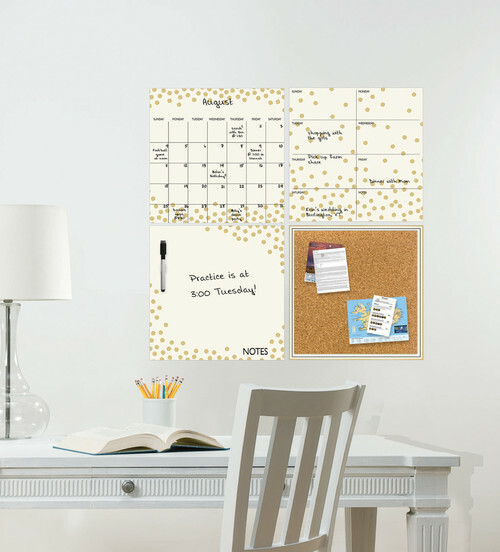 Having a wall calendar is a must for busy schedules, and can be especially useful for college students. An erasable one is best for making quick changes. Being able to see when book reports are due and who has an appointment on what date will go a long way at keeping your nerves from becoming frazzled. 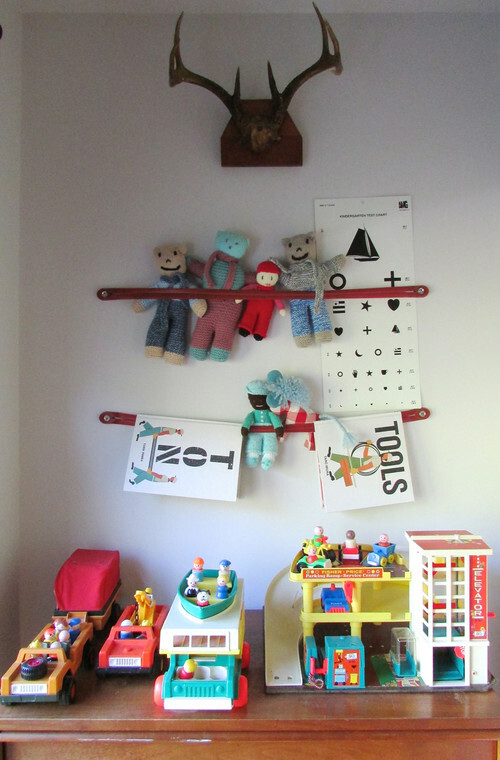 This and a variety of other wall organizers* are available from WallPops. 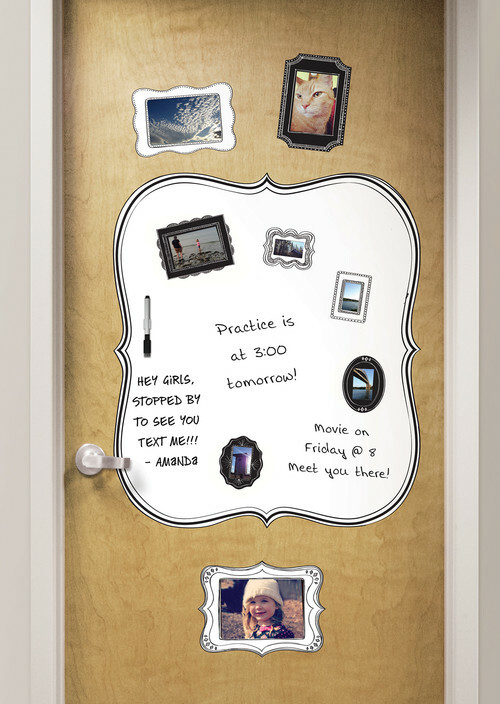 In addition, adding an erasable message board in an obvious area is great for keeping kids prepared for scheduled events. This stickable dry erase paper is available from as an entire bolt of dry erase peel and stick paper. * Make something like what you see above, or come up with your own ideas. 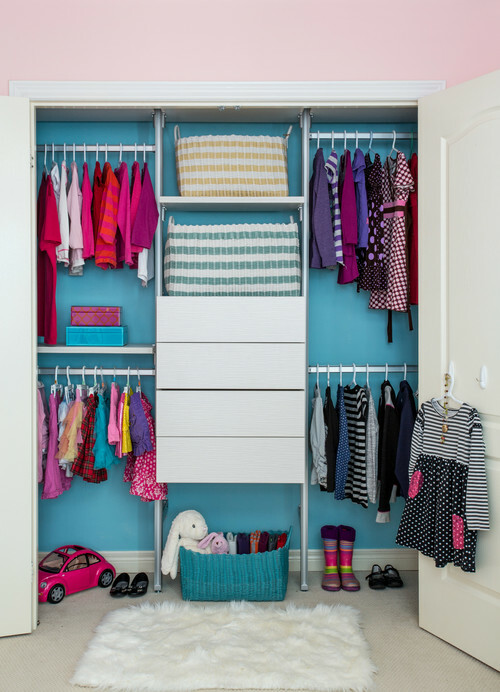 If you have a young child going back to school, or just starting out for their first year, being able to get them dressed each morning can sometimes be a trying event. If you have not experienced it yet, just let me warn you – there is going to come a day when they are not happy with what you want them to wear. Most likely they will be determined to wear something that is completely outside the realm of what you are willing to allow. Mornings like this can leave you feeling like you are beating your head against a brick wall. So, having a plan in place before this happens can save you many headaches. Giving them options and a way to know what those options are in advance can work well. I have two levels in the closet, and each level is divided into halves (as above). Prior to the beginning of the school year, with the help of the child, I organize the outfits into school appropriate (further divided by weather). I place these outfits on the bottom. On the top, I place the play and out of season clothing. I let them know that we are putting all the school outfits down low. They can choose what they wear, but only from the lower rack. They are happy to be in charge, and I don’t have to fight about their choices. (FYI: because I hang everything as outfits verses individual pieces, when I want to mix and match top and bottoms, I make changes during laundry time). 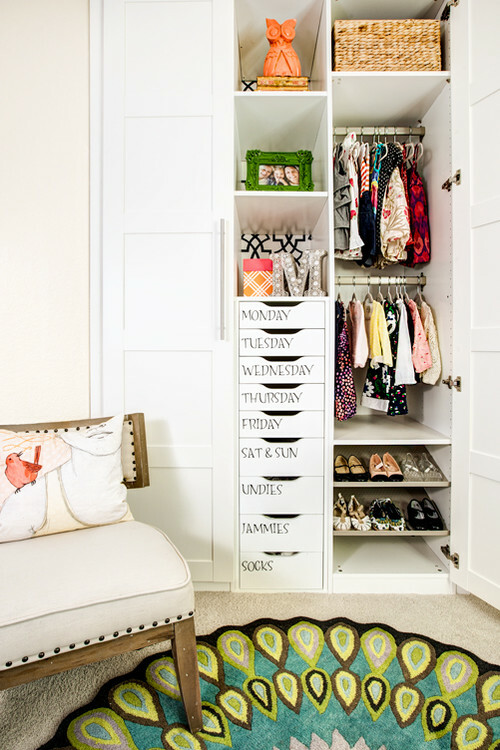 For more ideas on organizing small closets, check out my post on that topic. Ahhh, a place to catch everything that is thrown. That is how I think of my mud bench. This is probably one of the best things that a home can have for school age children. If you can further divide it up into sections, all the better. Providing each child with their own private dump space can head off arguments and teach respect of others’ property as well (i.e. your space is yours and my space is mine. We can not touch anything or place anything in anyone else’s area). If you do not have the space for a mud bench, sometimes just a few strategically placed hooks can serve the purpose just as well. Having a location next to the exit door can help prevent forgetting things. If you have some extra space inside a cabinet, it can be converted into a catch all for coats and backpacks. 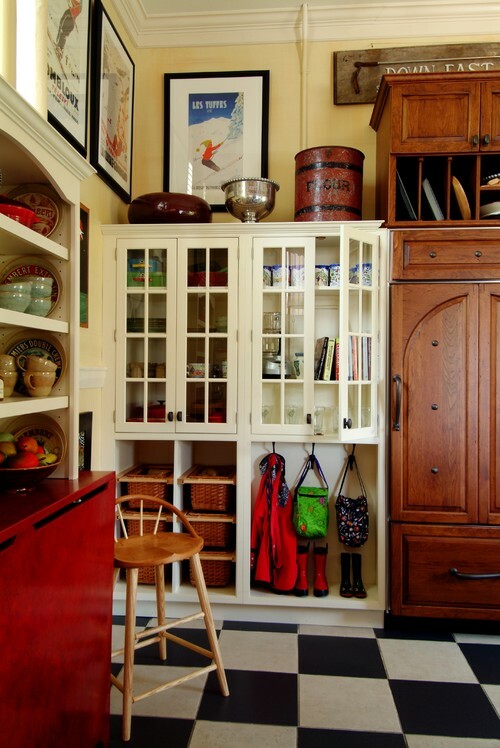 The above cabinet is a good example of utilizing unused space.